Born in Hobart, Tasmania, Lyall began studying piano and violin from an early age. He graduated from the Tasmanian Conservatorium of Music in 1974 having majored in Performance and Education. 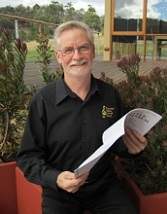 The following year, he commenced a career with the Tasmanian Department of Education that spanned almost 40 years, working variously as a classroom music teacher, a music consultant, a specialist instrumental music teacher and as a band director. Active in the local music scene over many years, Lyall has played in cabaret bands, big bands and rock bands, including the acclaimed Fern Chutney. For ten years he was a recording engineer at Red Planet Studios, during which time, in collaboration with Stewart Long, he wrote a considerable body of music for the ABC TV Education Unit and, for American Cable television, soundtracks for several documentary series including the award-winning ‘Frontiers of Flight’ which was produced as a joint venture by the Discovery Channel and the Smithsonian Institute. Lyall is also a published composer of ensemble and concert band pieces written especially for use in schools. Lyall joined the Derwent Valley Concert Band as a baritone saxophone player in 1999. He was appointed Assistant Conductor in 2009 and became Chief Conductor in 2010.